Make sure you follow Foodpanda to get amazing offers as soon as they become available. Don't forget to check the Foodpanda website to see if any offers are available. Foodpanda is a fast, hassle-free way to order in delicious food from a range of cuisines, straight to your front door. You can avoid the hassle of having to cook for yourself, along with the chore of doing the dishes, by browsing their website and picking your favourite meals for home delivery. If you are looking for more information relating to the ordering process, as well as the various cuisines on offer, then read on. How do I place an order with Foodpanda? You can order food in over 100 cities across the country, from the comfort of your home. To start your search, simply visit their homepage and enter your city and area into the two boxes provided. You will then be shown a list of available restaurants in your area, including the estimated delivery times and any cost associated with getting the food to your door. If you have a particular cuisine in mind, you can filter your search according to this, as well as whether other factors such as whether there are any special deals available. For more information regarding each restaurant, including the food on offer on the various menus, simply click the button labelled ‘Go to menu’. Upon doing so, you can start browsing through the dishes on offer, adding items to your order as you go along. At this stage you can also read reviews about the restaurant from people who have previously ordered food from them, which is great for when you want to make sure that your meal will match your standards and requirements. Once you have selected all of the items that you wish to purchase you can then proceed to the checkout page. How do I use my Foodpanda coupon? Confirm that the offer you have selected from vouchercloud applies to the dishes/ restaurant that you have selected. Copy the coupon code from vouchercloud and paste it into the box labelled ‘Enter your voucher code here’. 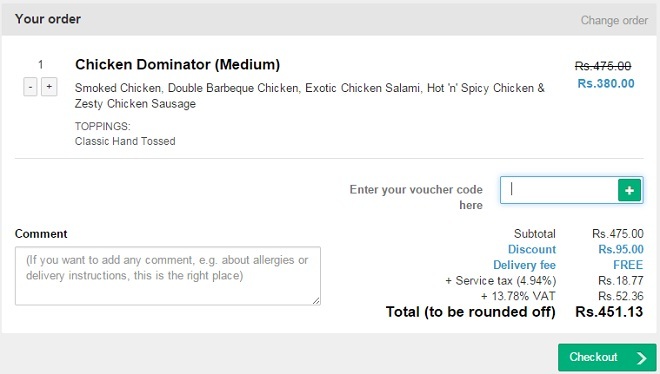 Click the button labelled with the ‘+’ character and double check that the discount has been applied to your order total. Proceed to the next stage of the checkout process and complete your order. You will receive confirmation that you order has been accepted via either an SMS to your mobile phone or an email. Now you can order in tasty dishes from your smart phone or tablet device, while you are out and about and on the move. 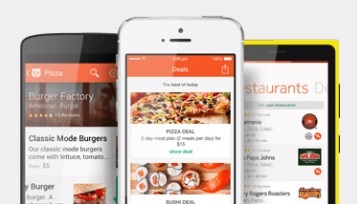 With just a few swipes of the finger you can browse through restaurants and select your favourite dishes. Regular users can benefit from an easy 1 step ordering process which allows you to quickly order the dishes that you have previously purchased, without having to re-select all of the different components that make up your favourite meals. What type of food can you order? If you would like to cancel your order for any reason, you can call the restaurant in question to do so. The contact details will be contained within the confirmation email or SMS that you will have been sent. Your refund should be processed within 2-3 days from the date of cancellation and the money should appear in your account between 6-7 days. Tired of cooking at home? Why not get some exciting and delicious food delivered to your door. Foodpanda is an online food ordering service that is guaranteed to end your search for delicious takeaway food without delay. You can order in from thousands of restaurants, all offering a range of different cuisines including North Indian, Mughlai, Chinese, South Indian and Italian. Now you can avoid paying full price as well as cleaning the dishes, just by checking the listed Foodpanda coupons at vouchercloud online. Traditionally you could only call your favourite restaurants and ask for the available options but Foodpanda has completely changed the traditional way of ordering takeaway food! Peruse the list of restaurants who can deliver to you at that time and compare the options and prices, and find something that tickles your tastebuds. So, if you are coming home from a busy day at work or a hectic day of shopping or just too lazy to cook you know where you need to look for getting the tasty food delivered direct to your door. With a few simple clicks of the mouse, you can get piping hot food delivered straight to your door, whether it’s a family favourite meal or last minute food fix. Simply enter your city and location and select which type of food you would like to feast upon. If you’re not sure what you would like to eat, you can check out their recommendations and suggestions to find mouth-watering pizzas, spicy curries or gourmet burgers and much more for affordable prices. Furthermore, the savings don’t stop there because we’ve got a Foodpanda coupon that will shave even more off your total bill! Foodpanda offers you the opportunity to order food for a different city, just select the city and the area and you will have the list of the restaurant who can deliver, so if you wanna treat your friends in different locations it’s easy to send some delicious grub to their door! So whether you are looking to treat someone else or your own tummy is rumbling, find something delectable to munch on with help from Foodpanda and vouchercloud today!